Fried tofu recipes make cooking with tofu easy and versatile. This crispy tofu recipe with vegetables is sure to become one of your favorite fried tofu recipes. It is easy to make and very healthy. Check out the nutritional information at the end of the recipe. This recipe is packed with vitamins, protein and calcium. Tofu is simply bean curd. It doesn't taste like much as it is, but it is wonderful at soaking up flavors, so once you learn how to cook it, you will find yourself cooking with tofu much more often. Cooking with tofu is easy with great tasting recipes like this one. Cut tofu crosswise into eight thick slices, then into cubes. Arrange the cubes in a single layer in a baking dish. Pour 2 tablespoons of teriyaki sauce or soy sauce over the tofu. Turn the cubes to coat them and then let them marinate at room temperature for 15 minutes. In a shallow dish, combine cornmeal and red pepper. Drain the tofu and discard the marinade. Carefully dip the pieces of tofu into the cornmeal mixture and press gently to coat both sides. Set the tofu aside. Pour 1 teaspoon of sesame oil into a large skillet. Heat over medium-high heat. Add red and yellow pepper strips. Stir fry for 2 minutes. Add the snow pea and green onions. Stir fry for 2 to 3 minutes more or until tender crisp. Remove the skillet from heat and stir in remaining teriyaki sauce. Transfer the vegetable mixture to a serving platter. Cover and keep warm. Wipe the skillet clean. Heat remaining sesame oil and cooking oil in the pan over medium heat. Cook the coated tofu slices for 2 to 3 minutes on each side or until crisp and golden brown. Mix the fried tofu with the vegetabales to serve, or serve the tofu pieces over the vegetable mixture. Sprinkle with toasted sesame seeds. If you need gluten free recipes, PLEASE make sure your soy or teriyaki sauce is gluten free. Some are and some are not. The toasted sesame seeds are optional but add a huge amount of flavor. I recommend that you don't leave them out. Sesame oil is wonderful, but it is a strong tasting oil so a little goes a long way. I wouldn't add more than is called for in the recipe until you taste it. Use whatever color peppers you like or have on hand. I like the added color of the red and yellow, but green peppers work well to. The cornmeal adds a nice crunch to the tofu pieces. You can also leave the tofu in long strips if you prefer. 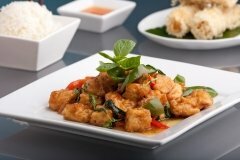 If you like fried tofu recipes like this one, have a look a spicy variation of this recipe on our sister site, cookingnook.com.